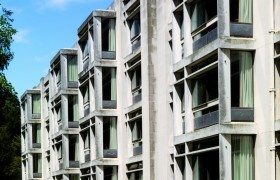 Powell & Moya’s Cripps Building at St John’s College, Cambridge, which was listed last year at Grade II*, has enjoyed a good press from the time of its completion in 1967. “A masterpiece by one of the best architectural partnerships in the country”, said Pevsner (who had held a fellowship at St John’s during his time as Slade Professor at Cambridge). “One of the finest pieces of college development in Cambridge since the war” was the AJ’s view. A few years earlier, while the building was still at planning stage, the youthful authors of Cambridge New Architecture declared that “this is a building probably more important than any of the other new college buildings in Cambridge… a splendid contribution to town planning as well as to architecture”. Five years after the completion of the project, however, one of those authors, Nicholas Taylor, questioned its success – “by its very nature it reinforces the glorious tradition of Cambridge, and in so doing it has fossilised a situation irrevocably that in the not so distant future may seem intolerable… the attitude which created this building may ultimately accelerate Cambridge’s decline”. Nearly 40 years on, neither Cambridge University nor St John’s, one of the university’s largest and richest colleges, show any signs of decline. The Cripps Building has provided St John’s with some problems over the years – the underfloor heating system failed many years ago and the flat roofs, like most of their period, sprang leaks. In 1987, the junior common room block which formed a single storey adjunct to the residential buildings was demolished and replaced by the bulky Fisher Building, its leaking roofs being cited as an argument for demolition – “a far greater punishment than the practice’s mistake with the roof details deserved”, as Dan Cruickshank has commented. At present, however, Cripps is undergoing a costly phased refurbishment which, the college believes, will equip for centuries more of useful life. 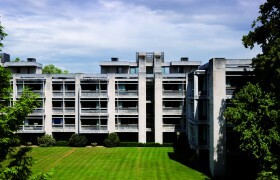 In contrast to the recent revamp of Powell & Moya’s Blue Boar Quad at Christ Church, Oxford – also listed II* – no more accommodation is being squeezed on to the site, though most of the rooms will be provided with the ensuite bathrooms that conferees (and even 21st century Oxbridge students) have come to expect. St John’s current Master, Professor Chris Dobson, has a refined architectural taste and greatly admires Powell & Moya’s work. Even before the listing, there was no prospect of the ruinous additions which have so marred the practice’s Cripps Court at Queens’ College. The Cripps Building, accommodating 200 undergraduates, was the result of a benefaction remarkable even by Cambridge standards. 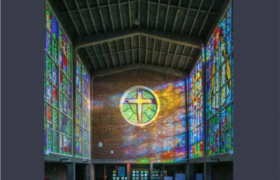 The entire cost (over £1 million in 1967) was met by Humphrey Cripps (1915-2000), an alumnus of the college who had made a fortune from manufacturing car components. The foundation Cripps established with his father, Cyril, funded a large hall of residence at Nottingham University (designed by McMorran & Whitby) and additions to Magdalene and Selwyn colleges as well as Queens’, but the St John’s Cripps Building forms his most notable memorial. 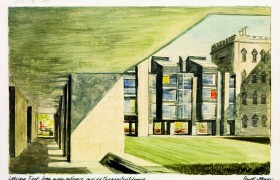 College archives vividly record the process whereby Powell & Moya won the commission, with Pevsner and Leslie Martin advising on possible architects (Aalto, Kahn and Gordon Bunshaft were briefly considered as well as Stirling, Casson, the Smithsons and Lasdun – the eventual runner-up). Cripps is the product of an optimistic era in which Cambridge University was expanding and benefiting from a growing influx of state school pupils. The new universities were setting the architectural pace and the ancient universities were not to be left behind. Powell & Moya’s contextual modernism provided an ideal solution to the problem of slotting new buildings into sensitive historic locations. The romantic, riverside site of Cripps, long owned by Merton College, Oxford, prompted a subtle break with the traditional court form which had shaped the development of St John’s over 350 years. As Philip Powell explained, “whilst never containing courtyards itself, the building gives the effect of courtyards by its confrontations with other buildings or with other parts of itself, continuing the collegiate pattern of court following court established by older parts of the college”. The ground floor of the building was left largely open, providing a covered route in the tradition of the old arcaded college courts. Few modern buildings in Britain have offered such an inspired response to context. A generous budget admittedly allowed for the use of fine materials, including the architects’ favoured Portland stone cladding, but it is as a masterpiece of composition that the Cripps Building ranks perhaps the finest of Powell & Moya’s completed works. Kenneth Powell is an architecture critic, journalist and writer and a former Director of the Twentieth Century Society. His many books include New London Architecture, New Architecture in Britain and City Reborn: Architecture and Regeneration in London, as well as monographs on Richard Rogers, Edward Cullinan and John McAslan & Partners. 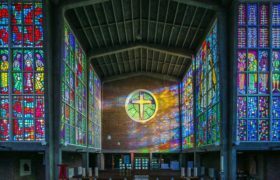 His latest book is Powell and Moya, part of the Twentieth Century Architects series published jointly by the Twentieth Century Society, RIBA Publishing and English Heritage.